Where is my Silver Parachute? Several private sector executives have left their companies with “golden parachute” retirement packages. 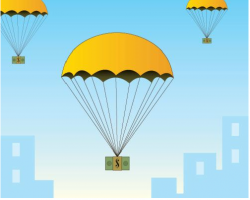 In the public sector, most dedicated employees hope only for reasonable retirement benefits — not even a “silver parachute.” But now they are finding their pensions may be in jeopardy. How did this happen? How can we save them? Public pension plans were intended to provide future rewards in return for current sacrifices by public employees. The deal is public employers will invest funds now to make payments in the future. In return, employees will accept lower wages than in the private sector. As Sasha Volokh explained in a Washington Post column, the data is mixed on whether public sector employees are paid more or less than private sector workers. Nevertheless, most of the studies recognize retirement pensions are part of the bargain. The deal required employees to work for compensation lower than what they could have earned in the private sector, but the “grand bargain” did not absolutely require employers to contribute to the pension funds. Despite the fact retirement benefits are “guaranteed” by legal, contractual and even constitutional protections, the deal does not look so good now. Up to 1994, the system was working. Then two things went wrong. First, local and state governments experienced fiscal stress due to management and economic issues. Resources that should have gone to the pension funds were spent for more immediate budgetary crises. Second, in response to pressure for wage increases, pension benefits were increased. Those increases did not require current cash payments, and therefore, any tax increases. Everyone hoped (or pretended) the pension fund investments would grow at unrealistically high rates. Unfortunately, reality set in. Not all the required funds were invested, and the ones that were did not grow as fast as hoped. As a result, pension systems today are underfunded. Some retirees have already lost substantial benefits. The debated estimates of the shortfall are range into the trillions. The amount is based on many factors, including the rate of return on investments, actual and projected contributions by employees and employers, anticipated retirement and vesting dates, contractual increases in benefits and life-span. The calculations are critical — lowering the projected rate of return from 7 percent to 4 percent can increase the shortfall from $1.8 trillion to $4.9 trillion. Consider these shortfalls compared to the U.S. Gross Domestic Product of $18.8 trillion. The national total shortfall is huge, but retirement payments come from individual pension plans. Since 1934, state and local governments have created almost 4,000 separate pension plans. They are subject to many regulations and much legislation. The Employee Retirement Income Security Act of 1974 set minimum private and public standards. The Government Accounting Standards Board (GASB) has formalized recommended practices and procedures. The latest pronouncements increase the transparency of pension fund reporting and specify more conservative calculations for the unfunded amounts. Based on an analysis by Morningstar, Inc., reported in Governing, 21% of state pension plans have serious funding gaps. Almost all other plans have some shortfall. Faced with the undeniable reality of shortfalls, the GASB has focused attention on Annually Required Contributions (ARC’s). These payments would cover both the cost for current employees (the “Normal Cost”) and installment payments to cover the shortfall in 20 to 30 years. Cutting benefits or raising employee contributions for new employees. Reducing benefits like Cost of Living Adjustments (COLA’s) for current employees. Extending the retirement age and the vesting period to claim retirement benefits. Recalculating the final average salary to lower the base for the retirement benefit. Switching from defined benefit to defined contribution plans for new employees (with lower benefit levels). What has not been done? Unfortunately, many plans have not made their ARC’s. Even if they had, many economists predict the required payments are not high enough. On a national level, the shortfall is staggering, but it may be more manageable at the plan level. If the economy continues to grow, what looks like staggering debt now may not be so bad. Individual public employees should check the status of their own fund in the Public Plans Data website, and either sleep soundly or act. Request the financial reports from the pension fund on reforms being considered. Stop the hemorrhage: lobby government budget officials to fully fund their ARC. Reduce future benefits by substituting current benefits in negotiated settlements. Monitor the process year-to-year by reviewing the audited financial statements. The American Legislative Exchange Council is recommending a series of reforms to make pension systems sustainable, including administrative changes like ending “pension spiking” and “double-dipping” along with substantive changes such as converting defined benefit plans to defined contribution and hybrid options, capping employer cost, and requiring payment of at least the full Normal Cost. Other changes would affect employees directly, like increasing employee contributions and extending retirement ages and vesting periods. Author: Minch Lewis is an adjunct professor at Syracuse University’s Maxwell School. He served as the elected City Auditor in Syracuse, NY, for 9 years. He has developed financial management systems for the affordable housing industry. He earned his master’s degree in Public Administration at the Maxwell School. He is a Certified Government Financial Manager. Lewis can be reached at [email protected].